The 16th Annual Super Bowl Gospel Celebration will air on Super Bowl Sunday (February 1st) at 10 AM ET on BET and again at 2 PM ET on Centric. 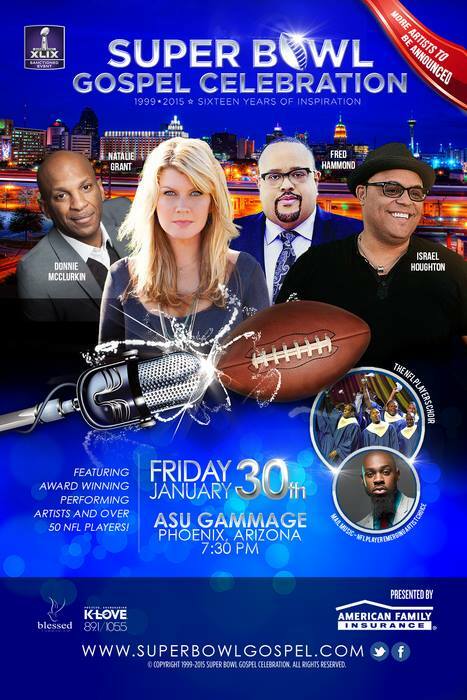 On Friday, January 30th, the 16th Annual Super Bowl Gospel Celebration will help kick off Super Bowl XLIX in Phoenix, AZ. The concert event and Super Bowl weekend favorite, has announced living legend Gladys Knight as its headlining performer and co-hosts – actress Holly Robinson Peete and retired NFL star, Rodney Peete. Joining Ms. Knight and the Peetes for the Super Bowl Gospel Celebration is an all-star lineup of entertainers (Tichina Arnold, Natalie Grant, Anthony Hamilton, Fred Hammond, Dave Hollister, Israel Houghton, David Mann, Tamela Mann, Mali Music, Donnie McClurkin, DeWayne Woods) and athletes (Antonio Brown – Pittsburgh Steelers, DeSean Jackson – Washington Redskins, Ray Lewis, Larry Fitzgerald – Arizona Cardinals, Rashad Jennings – New York Giants, Deion Sanders, Devon Still – Cincinnati Bengals), as well as the acclaimed NFL Players Choir (featuring current and retired players). Gayle Jackson, President, of the DeSean Jackson Foundation, encourages all of the Washington Redskins’ Nation, family and friends of the foundation founded by Mrs. Jackson and her son, DeSean Jackson, of the Washington Redskins, to view the gospel celebration when it airs on Super Bowl Sunday on BET at 10:00 a.m., if you are unable to attend the event. Tentative plans include an interview with DeSean Jackson that will be aired at that time.